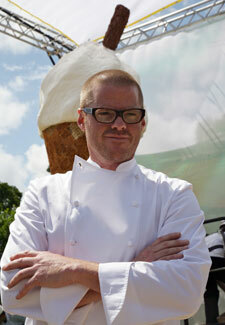 We love Heston Blumenthal’s wild and wacky food shows. While we’re not tempted to try the recipes at home – who has all the equipment?! – we do enjoy watching him make a spectacle out of food. In his new series, Heston revisits his childhood food memories and supersizes them. Tonight, the chef looks at breakfast, from the humble bowl of cereal to the classic fry up. But, of course, there’s a Heston-twist as he makes the world’s largest boiled egg and uses fried bread the size of carpet tiles! ‘The important thing for me was that all of the food was eaten,’ says Heston. ‘Getting past the technical challenges and making the food still taste delicious.